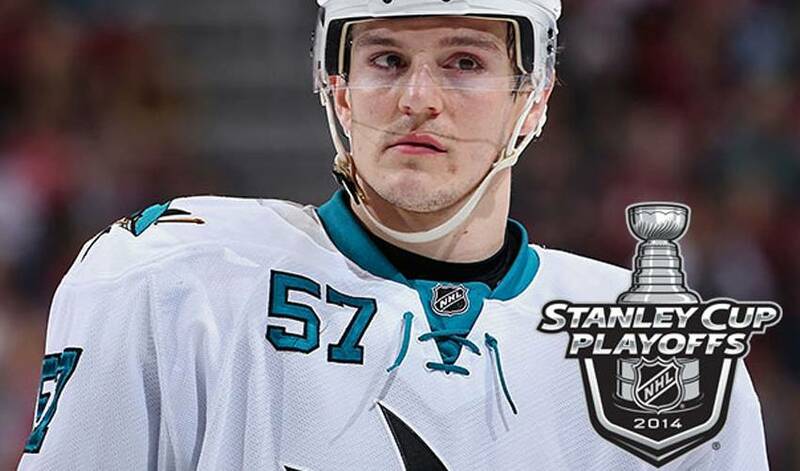 Tommy Wingels got his playoff game face on, so to speak, a little bit ahead of schedule. When the 26-year-old San Jose Sharks forward made the decision to grow his version of the traditional playoff beard, it wasn’t a tactical choice by Wingels, to get a head start on his teammates. The idea was, instead, brought to him. Two days before San Jose launched their bid for the organization’s first Stanley Cup, Wingels, who had an outstanding regular season for the Sharks, offered vague information on the status of his facial hair. While that part of his pre-game preparation might be a challenge, there’s no doubt Wingels is ready for primetime. In Game 1 of San Jose’s quarterfinal clash against state rival Los Angeles, he had one assist, two shots and four hits in 17:49 of ice time. Wingels added a helper in the next game, a dominant 7-2 Sharks win, and assisted on the game-tying goal in an eventual 4-3 OT win in Game 3. On Thursday night, a 6-3 loss, he had three shots on net and a team-best five hits in nearly 16 minutes. “It’s a time of year where you micro-manage your game,” said Wingels, who dished out six hits, had one blocked shot and two takeaways in Game 2. “You approach things on a shift-to-shift basis, looking at how you can make an impact in terms of individual matchups, what you can achieve by doing the little things. “It’s a dream come true to be in this position,” he added. And, for Wingels, it also offers an opportunity to build on a solid regular season. Confidence has been a constant theme for a Sharks team hungry to erase a litany of playoff disappointments over the years. Wingels is certainly comfortable playing his part, even if he doesn’t quite look the part.